Last year I threw away all my SAS books (to friends and colleagues in Beijing) before moving to US. You might agree that it’s not economically bound to transport such heavy books intercontinentally! Now I just start to build my SAS library one by one. It’s new by Carpenter and nice to check out. Use Proc Report! It is the workhorse procedure for SAS report writing and Proc Tabulate is not in fashion anymore! Btw, The historically called SAS DATA NULL report writing now has a brand new name, ODS Report Writing Interface, due to the incorporated ODS facility(which is cool). I think it deserves a new title. PS: I got it free from the latest RTSUG (Research Triangle SAS Users’ Group) meeting. Totally new title on this topic. Nice to approach to the new area. 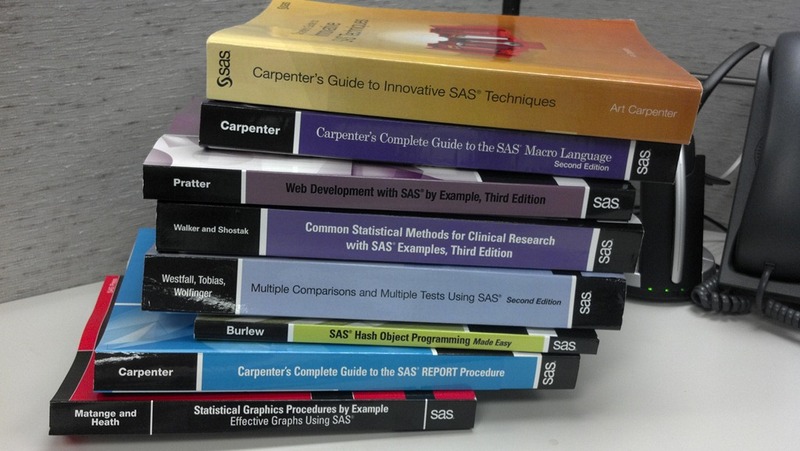 You may read plenty of ODS Graphics papers by these authors/developers from SAS Institute. Multiple comparison is an advanced topic and is beyond my limited statistical knowledge. My short term goal is just to follow the codes then interprete results. SAS web programming again. I might read this title before #4. Don Henderson was the former SAS developer and SAS/IntrNet was just his baby! I read and like Cody’s book on SAS functions and it’s always nice to check out his new title. I read the free chapter and it would be good book to polish my English as a technical blog writer.